Weaving is pattern and color. Pattern is my comfort zone. I’m left-brained and enjoy logic, structure and order. Numbers, formulas and equations make me happy. On car trips as a child, while my sister was reading her novel, I was pestering Dad for math problems to solve. Now, I analyze the patterns in license plates. Color is my growing edge. It’s personal and subjective, mysterious and a little scary. It’s the realm of art class which made my left brain squirm. As soon as art became an elective in school, I elected not to take it. 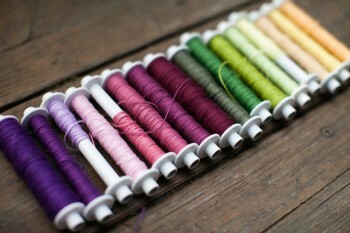 And yet, I’ve always been drawn to arrays of color – such as skeins of embroidery floss and bolts of fabric. I’m in my element exploring questions like this: If you have five colors, how many combinations of two colors you can get. (The answer is 10 and I can draw a handy diagram to illustrate it). Ask me to pick the five colors and I’m a lot less confident. When I first started weaving, the samples I wove at the beginning of each new project were small. If there were six colors in the warp, I wove several repeats of the pattern with each of those six colors, and only those six colors. I was trying to conserve warp, not wanting to “waste” it on a sample. But I also didn’t know what other colors to try. And since I’d only ordered what I needed for that particular project, I didn’t have a lot of colors to choose from. I kept weaving. Even if I was playing it safe with colors, I was learning. Little things would happen, like I’d use pumpkin to mark the end of one Bermuda blue & pale yellow towel and the beginning of the next and discover that I really liked this combination. Then I’d weave a little sample with pumpkin to get more information. And since I was weaving another sample, I tried emerald too. As I wove I gained not just confidence but also curiosity. Plus I acquired more colors and now have at least 75 to choose from. As I developed a “what if” attitude, the color theory I’d read was coming alive. Even with beautiful photographs to illustrate the idea that dark colors recede, I didn’t understand this until I chose a weft color that was darker than all the warp colors and noticed what happened. When I picked a pink and a gray – two colors that looked quite different on their individual tubes – I learned that I also needed to pay attention to how light or dark a color is. Sometimes now I can get carried away with the creative process, wanting to try just one more color. And then another. And another. It might seem silly to try grass green and emerald and dusty green. But one will make the towel look more vibrant, another more subdued, and the third more soothing. I just started a new project. As I wove the sample, I reflected on my journey with color. The playfulness and “what if” attitude that come so naturally when I explore pattern variations, have spilled over into experimenting with colors. The sample ended up being over a yard long and I tried out nineteen colors before reminding myself that I had enough information to weave ten towels. Color is my growing edge. It remains personal and subjective. But as I lean into it, as I experiment and play, it becomes less scary and I grow more comfortable with its mysteries. My invitation to you: What is your growing edge? What ways have you found to lean into it? I’d love to hear. My growing edge is allowing myself to own my playfulness professionally. I’ve not given myself full permission as it seemed like an oxymoron–how can I be playful and professional at the same time? And, what will people think? Well, I’ve been doing it for years, just haven’t named it for what it is. 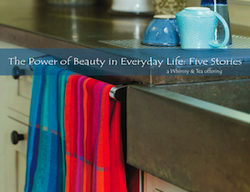 And, Marilyn, color and design is vital to nourishing my body and soul!